Check your mail for a buy one $5 instant scratch-off ticket, get one $2 instant scratch-off ticket free. Coupon expires 9/24/11. I just wonder if all the $2 tickets are free ticket winners….hmmm. Get a free any size fountain drink with coupon in the 8/31/11 Cleveland Plain Dealer. AM/PM is located in BP gas stations. Look for coupons that came in the mail for Burger King. Many BOGO coupons plus one for a FREE 4 piece chicken nuggets. And don’t forget to get your free Burger King paper crown that is sure to impress. Sage Peachtree Pro Accounting 2012 FREE after mail-in-rebate at Staples.com. $49 for $140 worth of bamboo linens from National Hotel Bed Supply – free shipping! $5 for a two-year subscription to Parents magazine ($24 value). $9.30 for 3qts. of “Fresh You Pick” Red Raspberries ($18.60 Value) at Rosby Farms in Brooklyn Heights. $10 Oil Change at Bob’s Adams Sunoco Automotive! Includes: Lube, Oil & Filter + 30 Point Inspection! $22 Value. Located in Bedford. $25 for a Deluxe Party Special w/ Pizza and Chicken from Don Gi’s! ($50 Value). Located in Old Brooklyn. Pay $5 for $10 to spend at Stoddard’s Frozen Custard in Kent. For $5 get $10 to Spend on Ice Cream and Frozen Treats at Cibik’s Dairy Island in Bainbridge. For $5, treat yourself to $10 worth of mouth-watering cuisine at Gus’s Family Restaurant in Old Brooklyn. • For $10, you get bowling night for two (up to a $27 total value). • For $35, you get a bowling night for eight (up to a $108 total value). •For $15, you get one 20-minute private lesson for an individual or couple (a $49 value). •For $20, you get one 40-minute private lesson for an individual or couple (a $95 value). •For $25, you get a two-lesson package with one 20-minute private and one 40-minute private lesson (a $144 value). For $10, you get $20 worth of dinner fare at Si Señor Mexican Restaurant. This Groupon is valid at Si Señor’s at Kamm’s Corners. For $20, you get $40 worth of running shoes and gear at Cleveland Running Company in Shaker Heights. •$20 for $40 toward a rental from Avis Car Rental. Use Atlanta for city. Hit the jackpot with this deal to the Tropicana in Las Vegas. •Bottle of Ciroc vodka or Ambhar tequila at check in. Get a $10 gas card with $30 purchase of items listed in ad. Get Rapala lures for over 70% off. Up to 60% off on apparel, footwear, fishing, hunting, camping, and marine items clearance. You can also use coupon code NER246 to get 40% off one item. Save up to $500 in federal tax credits for energy efficient windows and heating/cooling systems. See details at http://www.energystar.gov. Don’t wait for winter to get it done. Get 30% off stains and paints and Fathead wall graphics from August 28th through September 5th. 20% off entire purchase coupon in ad. Get $10 in register rewards with purchase of P&G products listed in ad – plus use coupons found in Sunday’s paper. Look for $10 off a $30 purchase coupon in ad. Look for coupons for Swiffer, Febreeze, Dawn, Mr Clean/Gain, and Cascade in magazine. Look for a free Hershey’s Air Delight coupon in Smart Source insert in paper. Do you have earthquake insurance? I do! There have been some small ones on the east side so for the small amount my insurance company charges I got it. I’m thinking after the 5.9 one in Virginia that maybe it could be around the corner. If anything at least these earthquakes will save having to shake your martinis. Coupons.com came out with a survey that found Atlanta printed the most digital coupons from their sites. Cleveland was ranked a respectable 8th! Three cities from Ohio were in the top 20. They said that adults with household income of over $100,000 are twice as likely to have redeemed coupons printed from an online source than adults with household income less than $35,000. Also adults with college degrees are almost twice as likely to have used coupons I the prior six months as those who didn’t graduate from high school. They made it sound like that was a good thing as if the more money you made and educated you were, the more you printed coupons. The way I look at it was that people at lower incomes can’t afford a PC and internet and printing coupons. Those with college degrees obviously made more and those with less education might not know how to use a PC. Coupon inserts in the paper cut across socio-economic ranges as most everyone can purchase a paper with coupons in them. Digital coupons will never replace the number or usage of coupon inserts in the newspaper for that reason. Companies that offer digital coupons do provide additional coupons so that is good, but not always for those that need them the most. Same goes for the push that stores are making with e-coupons. It is very time-consuming to go through the coupons online and print them. If they make them worth a person’s time by being of high value and aren’t cumbersome to print multiples then it sometimes is worth the effort. The scores are based on each city’s total printed coupon savings on Coupons.com and Coupons.com network in 2010 relative to its population size. Interestingly only 4 cities increased their usage from 2009. Check this past week’s mail for a coupon flyer from McDonalds. Lots of BOGO coupons and one for a free small coffee. Get a free breakfast entree at Chik-Fil-A. Get 100 bonus coupons at a reserved birthday party Friday or Sunday at participating locations -no coupon required. Get 80% off already discounted restaurant gift certificates! Get $25 gift certificates for $2 (normally $10)! Use promo code “TASTY” at checkout. Over 18,000 restaurants to choose from all across the country! Over 250 in the northeast Ohio area. No expirations date on the certificates! Remember when the Miami Heat was just about to lose to the Dallas Mavericks? We decided to go forward with a trip to Miami and then a Western Caribbean cruise after they lost the series. I couldn’t go knowing until I knew Miami lost. So I took my talents to South Beach knowing the Heat lost and Cleveland “won”. Going in August is a gamble being that there can be a hurricane. Thank you Irene for not ruining our vacation as we got out of Miami before it hit near there and our cruise was in the western part of the Caribbean. Using a credit card that offers travel insurance is the way to insure against weather and other travel related issues. I had miles on American Airlines for a free ticket. Flights were running over $400. I got an extra 25,000 miles after signing up for a credit card from American a few years back. I also got bonus miles after making a certain amount of purchases the first couple months. Getting rewards for signing up for a credit card can be quite worth it when flight prices have gone up a ton. A good place to find the best rewards for credit cards can be found at http://www.creditcards.com. Using the miles I was allowed to check two bags for free. Otherwise a second bag would’ve cost $20. If you check your bags online you can get better rates than doing it at the airport. We booked a cruise through http://www.vacationstogo.com. We got a 7 night Western Caribbean cruise that stopped at Grand Cayman, Cozumel, Roatan, and Belize. The cost was $529. We tried to upgrade for free, but the cruise was booked solid. We almost went on a 12 night cruise through the Mediterranean that cost $799. The flights were very expensive and we would be gone too long though. It was our first Carnival cruise. It was ok. I heard they were more fun than other cruiselines, but I didn’t see any evidence of that. It wasn’t like the Flats in its heyday. Food at dinner was good. Lunch and breakfast not so much. We got the inside cabin. The oceanview rooms are a rip off. Just get the inside cabin. The little port window is so small is usually covered up by a curtain. Not worth the extra hundred or two per person for it. The rooms were super dark since there was no window making it great for sleeping, but I’m sure there were extra boogeymen under the bed being it was so dark. 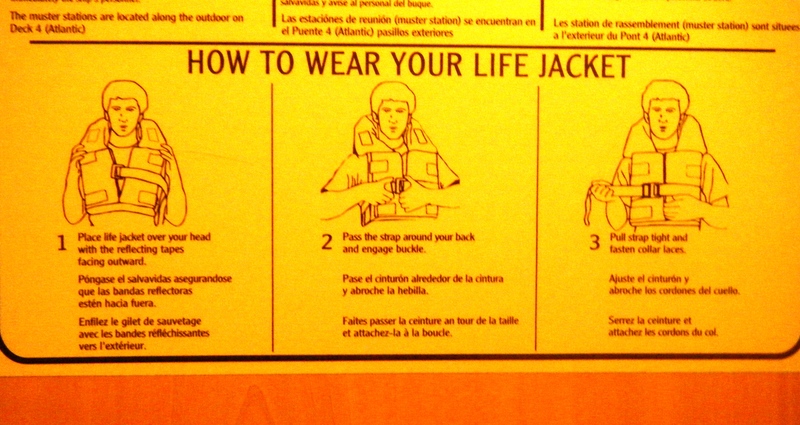 Will Ferrell apparently posed for the life jacket instructions that were on the door of our cabin. We stayed in Miami before the trip I never was in Miami. I booked a room for a brand new Best Western for $79 a night. I checked BestWestern.com and Hotels.com to find the best hotel deals. We stayed in Fort Lauderdale first. We stayed on a hotel on Miami Beach too and got it for free when they lost power and relocated us off the strip! We were able to bring one bottle of wine each into the ship. We went shopping for the wine and we got it at…Target. Yep, that fine store sells wine. A lot of stores that never sold food now sell food and alcohol like Target, CVS, Rite Aid, and Walgreens. In Florida you can use coupons for wine. There was one on the bottle we got, a Seven Daughters Meritage. Plus we got a Bogle Petite Syrah. I liked it best. Both on sale too. I checked out Publix and the price was higher there surprisingly. I also found $1 off produce and other of those types of coupons. I was surprised how expensive the produce was. Bananas were 24 cents a banana…not per pound! Peaches were $1.99 a pound. Strawberries were $3.99 per pound. The one produce item that was a great deal was for avocados. They were $1.29 each and they were the size of a child’s head. Not like the eyeball sized ones we have in Ohio. I got a Restaurant.com for $2 for a restaurant on Miami Beach that got me $25 off the bill. Problem Is I got a parking ticket for $45. Pay it online though before the due date and it cost $18. On Miami Beach they don’t have meters where you park. They have these hidden pay junctions that spit out receipts when you pay for parking. I tried paying it when we parked in another spot but the meter thing was busted. Ate my dollar and it said there was no refund or number to call. Minus one for Miami. There were lots of deals for appetizers and drinks during happy hour. The gal at the one restaurant even gave us a 2 for 1 deal even though it was late at night. Always pays to ask. Lots of restaurants were handing out cards with discounts. 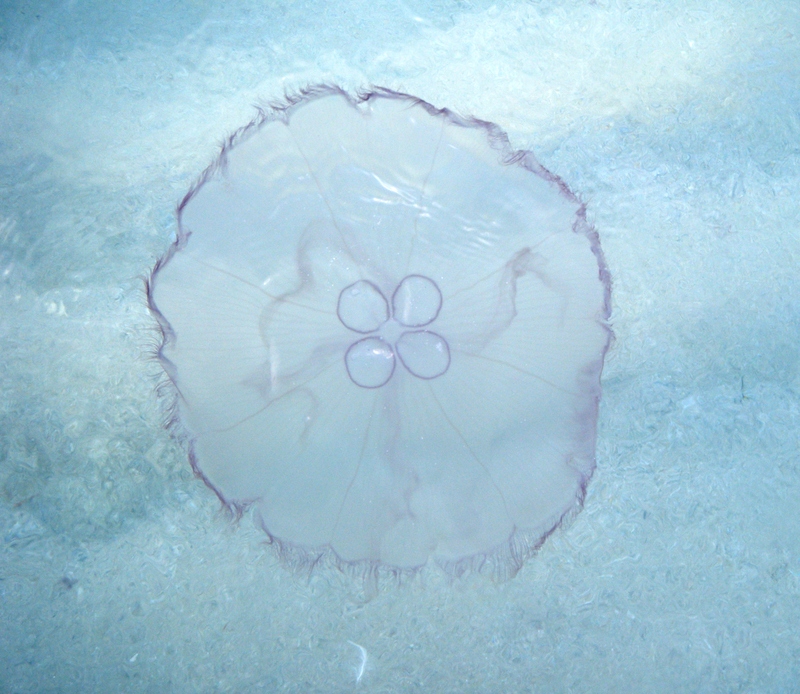 On Miami Beach there were tons of jellyfish. There had to be one every two feet. They were the size of dinner plates. A guy on the beach told me to pee on the sting if I get stung. I thought he was nuts, but I was told the same by someone that used to live there too. Apparently it heals the sting. As much as I wanted to test it I decided to leave it alone. We got a wine package that got us a 25% discount on the wine we get on the ship. We liked the Murphy Goode Merlot best. We weren’t done with the liquor sale yet. We got two 1 liter bottles of Absolut for $19.99 and two 1 liter Crown Royale bottles for $34.99. Quite the deal. The guy that sold us the Absolute and Crown Royale was supposed to hold it until the end of the cruise. Instead he gave it to us. Man, we could really have some fun on this cruise. Or better yet, I could set up a stand and sell shots for much cheaper that what they charge on the cruise. On shore we picked up a couple bottles of wine in Cozumel to take on the ship. Thing is you aren’t allowed to bring it to your cabin. They have to give you your bottles on the last night. So you can drink them on that night. We got them at a grocery store for $7 a bottle. They took American money at about 12 pesos for a U.S. dollar. The cheapest price for a bottle on the ship was $22 so we made out. I tried to ferment some grapes from the buffet too to make some wine. The batch tasted more like vinegar. Next time I will have to bring some oak barrels to age it some. I was a snorkeling fool as I love to snorkel so at each port that is what we did. All the ports were known for it. I thought Roatan was the best. It was in Honduras. The water was churned some though from a tropical storm that came through the week before. The reefs were awesome though. Better than what I saw in Belize, Cozumel, and the Cayman Islands. The water in Roatan was extremely salty. It burned my eyes. I saw Aquaman while I was snorkeling and we hung out some and he said I should try putting Vaseline on my eyes before I snorkel. We hung out at some underwater bars and nightclubs. I did some line dances with some red snapper and grouper. Those are some craaazy fish. At Belize we saw some pharmacies that sold drugs over the counter – no prescription needed for medication like Viagra, Prozac, Valium, and Vicodin. They cost about the same as a co-pay, around $20 or so for a monthly supply. No questions asked. I stepped in one and a guy came in and loudly asked for Viagra. Good thing his room wasn’t next to ours. I’m just amazed though that these pharmacies charge so little. Why can’t the U.S. do the same? What a racket these drug makers and insurance companies have going. I mean think about it. If the U.S. allowed it I could go to Walgreens and get some Valium along with a Snickers bar if I wanted to. And maybe get a register reward for it. One of the best things we did was get a taxi or bus to where we needed to go instead of paying an excursion company to take us where we wanted to go. In Grand Cayman we got a bus for $2.50 per person and the taxi was $4 to take us to the beach and back. An excursion company would have cost us at least $30 to do so …per person! Some of the beaches are just a short walking distance so don’t book an excursion until you find out how far they are as it can save you tons. We walked the whole beach which was neat. It was a 7 mile beach. We ate at a restaurant along the beach along with an iguana that paid us a visit. 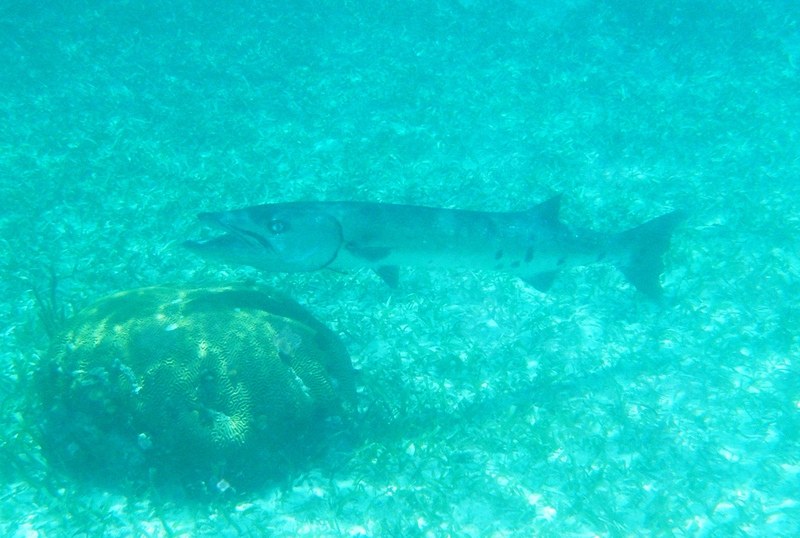 While snorkeling there I saw a stingray. Good thing I remembered Aquaman told me not to tickle any fish as I had planned to do so, but later found from him that they are not very fond of it. So to entertain myself I put some marshmallows on its tail instead. I stopped at a grocery store in Grand Cayman. Wow their prices were high. A whole pineapple was $5.99. A 2 liter of Pepsi was $2.69. Cozumel was nuts with people trying to get you to go into their store. It was annoying. We did eat at a hole-in-the-wall restaurant to get guacamole and chips. They gave us some hot sauce dips with it. Perfect! Cheap too as it was off the beaten path. We got a coconut pecan puff pastry for about 50 cents. Couldn’t beat that deal. 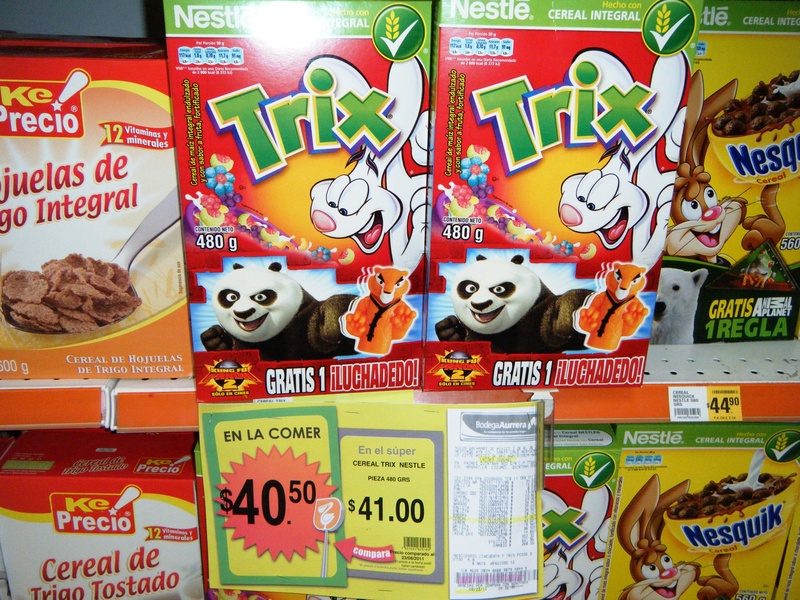 Cereal in Cozumel was $40! Gotcha…that’s in Pesos making it around $3. Prices at the grocery store there were pretty normal. Check out this escalator to the store. 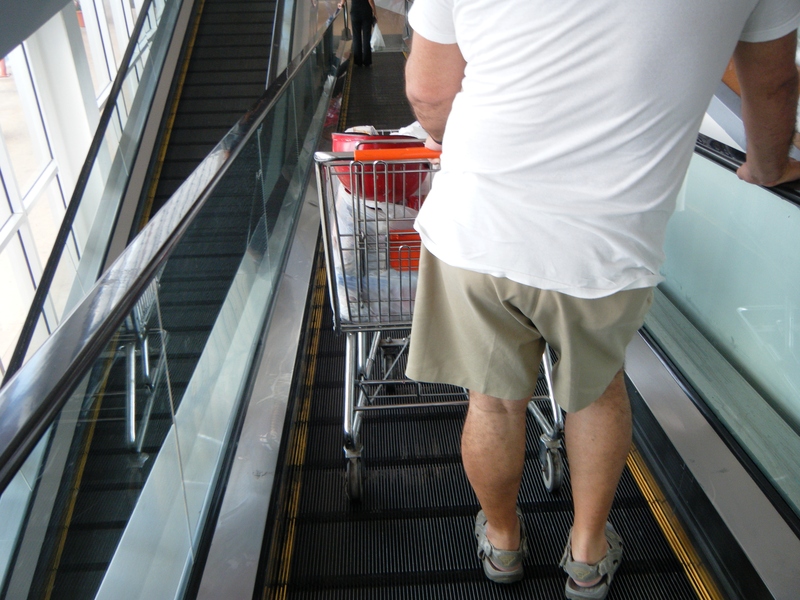 You can go up and down them with your shopping cart! There were so many stores that had signs that said “you break it, you buy it”. If I ever decide to open a store I’m gonna name it “U Break It, U Buy It”. I will balance everything on toothpicks and make the aisles real small and I’ll let loose rats in the store. You can haggle pretty much anywhere. In Belize I tried to get a better deal to do a snorkeling excursion to Goff’s Caye. It’s an island next to their barrier reef which is supposed to be second largest in the world next to the Great Barrier Reef in Australia. They wouldn’t go down in price. It was about $30 cheaper per person the cruise’s excursion price. But when they said their credit card machine was down I knew I could wheel and deal. I only had so much cash and they took what I had and told me not to tell anyone. The Caye was tiny. It was like one of those cartoons with one palm tree. We saw a huge barracuda in the water. I wanted to brush it’s teeth, but Aquaman told me they don’t like that and prefer to get rid of their plaque chewing on swimmers. The ship had a restaurant that charged extra. It was a steakhouse. A total rip-off as they charged $30 per person. Why bother when they served a filet mignon for dinner one day and steaks any other day. Some people like to feel special and go there for one night. I say instead save the $60 per couple and instead give it to me and I will tell you how special you are. I got a massage. Great deal on the last day at $50 off. But boy did they try to sell their oils and lotions and stuff after the massage. I felt like I was in Cozumel where they tried to hawk their wares. I ran out of the room screaming. Dramatic exits always stun people into stop talking. When travelling I love getting the Sunday paper where I am at since they usually have more coupons than I normally get in the Sunday paper. At the airport I searched around to see if anyone left their paper too so that I could get extra inserts. All I could find was a USA Today. That was until I threw a jellyfish on the head of an unsuspecting lady that had the Sunday paper and grabbed the paper as she dropped it on the ground. Don’t worry, I told her to pee on herself to heal the sting. 8 Gb SDHC memory card – $19.99 or 16 Gb at $34.99 – plus get a free movie download with purchase. Get a $10 Best Buy gift card when you spend $50 or more on TV titles on Blu-Ray or DVD. Get $10 in extrabucks (coupon that print at the end of the receipt that can be used on most anything in the store) when you buy $25 on listed Charmin, Bounty, or Puffs Plus Lotion Tissues listed in ad. Plus use coupons on each. Get $10 gas card when purchasing $30 in listed items in ad. One being BOGO Planters nuts. Look for $5 off total purchase of $39.98 or higher purchase coupon in mailed ad. Daily PD is 50 cents and Sunday paper is $1.25 at Walgreens through 9/17/11. Get a complimentary appetizer when you sign up to Bravo’s e-club at http://www.bravoitalian.com. Enjoy BRAVO! Bar Bites for only $2.95! Offered Monday- Friday from 3-7 pm and 9 pm- Close – in bar only. $5 Martini Night – every Wednesday in the bar only. $6 in Breakfast or Lunch from Claudette’s Cafe and Deli! ($12 Value). Located in Westlake. For $60, turn your parched, frizzy hair into luscious locks with a Keratin treatment, highlights, and a haircut from The Savvy Salon in Parma (regularly $135). For $7, you get a Lake County Captains baseball outing for two at Classic Park in Eastlake (a $33.50 total value). •Two sodas (a $10 value). •Against the West Michigan Whitecaps on Wednesday, August 31 at 7 p.m.
•Against the Whitecaps on Thursday, September 1 at 7 p.m.
•Against the Whitecaps on Friday, September 2 at 7 p.m.
•Against the Bowling Green Hot Rods on Saturday, September 3 at 7 p.m.
•Against the Hot Rods on Sunday, September 4 at 1 p.m.
•Against the Hot Rods on Monday, September 5 at 1 p.m.
For $23, you get one ticket for a rear-orchestra seat to see Rick Springfield at the Akron Civic Theatre on September 4 at 6:30 pm. (a $47 value). My friend drented one for their wedding and it was a blast. $350 for Four-Hour Photo-Booth Rental ($700 Value). Remember to use your $5 off $20 coupon in the Our Town book for additional discount! Get up to 30% off your Old Navy purchase. Click here for your surprise discount. Offer ends 8/19. Save 60% off a one-month membership toward any Gymboree Play & Music location in the United States. Located at the Lake County Fairgrounds in Painesville. Free Midway acts. Kids 12 and under free. Admission doesn’t include rides. Tues., August 16th – Free admission until 3 PM. Freebie health and beauty treatments. Wed., August 17th – Free admission until 3 PM. All Veterans, football players in jerseys, cheerleaders, coaches in school wear, and band members with band shirts free admission all day. Thurs., August 18th – Kids 18 and under free admission all day. Fri., August 19th – Seniors free admission until 3 PM. You are currently browsing the JoeTheCouponGuy.com Deals Blog blog archives for August, 2011.